If you are reading this, congratulations! You successfully made it through the holiday season. In fact, we’re already a week into 2019. Honestly, we can’t believe it. It seems like 2000 was just yesterday. We blinked. And now it’s 2019. Oh well, as the famous Steve Miller Band song goes “time keeps on slipping, slipping, slipping into the future. If you made any resolutions for the new year, we hope you are well on your way to achieving them. Don’t worry, though. This isn’t a blog about New Year’s Resolutions. You can find that blog here: The Wiser Home Care Services Comprehensive Guide to Elderly New Year’s Resolutions. You see, during the month of December everyone is so caught up with Christmas and New Year’s they forget about another little important day: the winter solstice. In fact, that day, December 21st, snuck right in and passed without many people recognizing its entrance. However, even though winter plays a part in contributing to this week’s blog, it is still not what this week’s blog is all about. So, what is this week’s blog all about? We are glad you asked. In observance of National Winter Skin Relief Day, January 8th, we are going to explore winter skin care tips for your elderly loved one. What is National Winter Skin Relief Day? Although skin health is important year-round, the cold weather during winter makes our skin more susceptible to cracking. Considering this, in 2017 CeraVe Skincare declared January 8thNational Winter Skin Relief Day as a way to remind people of the importance of caring for their skin during harsh winter weather. 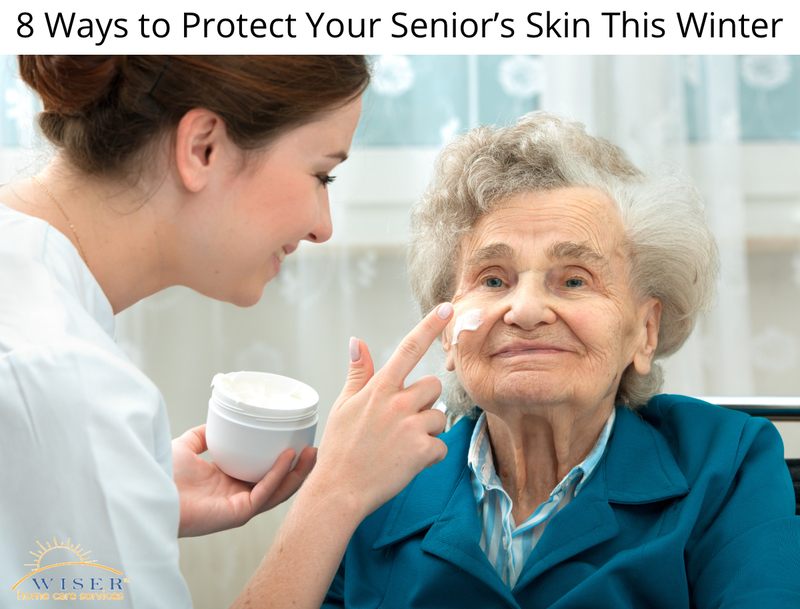 As we celebrate the 3rdannual National Winter Skin Relief Day, us here at Wiser Home Care Services would like to share our 8 tips for elderly skin care during the winter. We know. We know. Long, hot showers are one of the best things about winter, but they are one of the worst things for your skin. You see, the heat depletes skin of its natural oils which speeds up the skin-cracking process. If you do take a hot shower, make sure you use a skin moisturizer immediately afterwards. If dry skin is bad, then wet skin must be good, right? Wrong. When washing hands or after taking a shower or a bath, it is critical to dry the skin completely. Skin left wet, especially between fingers and toes and in the midriff can lead to fungal infections. As we age, the amount of ‘structural fiber’ our bodies produce lowers. This contributes to skin health issues. To combat it, elderly loved ones should consume a diet rich in nutrients. For example, experts suggest that a Vitamin-A rich diet helps in strengthening the skin’s resistance to infection while a Vitamin-C rich diet promotes fast healing. Sunscreen isn’t just for Summertime. UV rays are present all the time, and in fact, during Winter the rays can reflect off the snow and cause a sun burn. So, before you or your elderly loved one goes out, make sure you lather on some SPF. The cool winter air is typically dry and can even remove the moisture from the air in your house. The lack of moisture in the air is what causes skin to crack during the winter. Using a humidifier adds moisture back to the air, which is why using one in your elderly loved one’s house is so important during the winter. Most people know smoking is bad for their lungs, but did you know it is also bad for your skin? Smoking is known to destroy collagen, elastin, and tissues that help people maintain their young looks. In addition, it causes premature wrinkling and reduces the moisture in your skin. Quitting may not reverse the already noticed effects of smoking, but it will stop the continued degradation of your loved one’s skin. Hydrate. Your skin and your body. Keeping your body hydrated and your skin moisturized is critical for elderly skin health during the winter. To do this, make sure your elderly loved one is drinking plenty of water and using an oil-based moisturizer. The oil will help seal water inside your loved one’s skin. Exfoliation is an important step in the skin care process. The process of exfoliation sends signals to the skin to make more collagen and wards of dead skin to help with the producing new skin. This should only be done twice a week at most. If you still have questions and concerns about how to help your elderly loved one maintain their skin health, please feel free to contact us. We can help your family establish a care plan to personally accommodate your loved one needs.